We actively promote a healthy lifestyle across the school by modelling good practise and by having high expectations. These expectations are also mirrored in the quality of food and drink we encourage in school. School meals are provided by The Farm Kitchen, the current cost of these meals are £2.40 per day. School Meals are ordered online directly through The Farm Kitchen, you will need to register your child online with The Farm Kitchen and meals must be ordered a week in advance. We are able to check if your child is entitled to Free School Meals, if you would like to do this please see the school ofice staff who will be able to help you. The Farm Kitchen have recently been awarded Caterer of the Year at the Select Lincolnshire Food and Drinks Awards 2015, the comments received " The judges felt that the winner had: excelled in their commitment to Lincolnshire communities by encouraging their customers to shop local and eat healthily. Leading by example in providing meals to over 55 schools in Lincolnshire"
As part of the Government initiative all children in Reception, Year 1 and Year 2 are now entitled to Free School Meals. These are ordered in the same way online with The Farm Kitchen. We have set up all parents with an account and password to enable them to order meals. If you have any problems with this or are unable to access the internet at home please contact the school office who will be able to assist you. 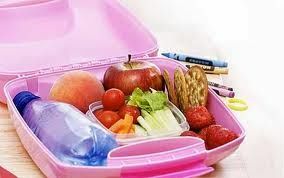 Children are welcome to bring in a healthy packed lunch into school. If your child is having a packed lunch it should be bought into school in a suitable container and should not contain fizzy or canned drinks/hot drinks/chewing gum/sweets. We promote healthy lunches and lunchboxes should be based on the eatwell plate food groups (www.eatwell.gov.uk) which promotes a balance and variety in the diet. Parents and pupils should try to include something from each of the eatwell food groups in the lunch box and ensure that this includes a drink. A healthy lunchbox should include: A good portion of starchy food, for example roll or bread, wraps, pitta bread, pasta or rice salad. Plenty of fruit and vegetables, for example an apple, satsuma, handful of cherry tomatoes, carrot sticks or a small box of raisins. A portion of dairy food for example an individual cheese portion or a pot of yoghurt. A portion of lean meat, fish, eggs or beans, for example ham, chicken, beef, tuna, egg or houmous. Article 24- Every child has the right to the best possible health. Governments must provide good quality health care, clean water, nutritious food and a clean environment so that children can stay healthy. Richer countries must help poorer countries achieve this.